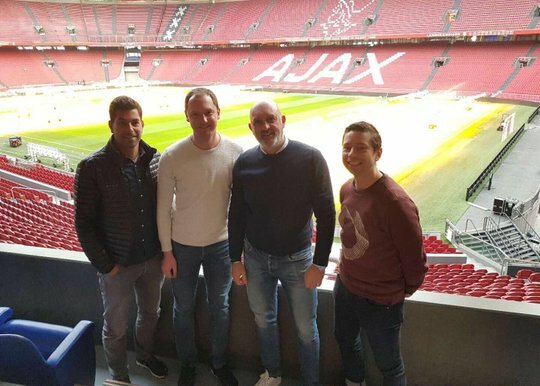 At the beginning of this year, Ajax trainers Ed Engelkes, Ralf Kebsch, Marc Gosselink and Ian Taylor started developing a youth training programme for top Chinese club Guangzhou R&F FC. They have all the knowledge and experience they need to set up the Ajax Coaching Academy, but weren’t sure how they were going to communicate with the Chinese children. In preparation for their deployment to China, the Ajax trainers took a Chinese language course at Regina Coeli in December. It was hard work, but it gave the four men a solid foundation in the language. At the beginning of the course, it was really difficult to distinguish between all the tones and sounds of the language. The four trainers were immersed in Chinese with the Nuns of Vught from eight in the morning to nine in the evening for five days. They had lessons from four language trainers from China and Taiwan. Besides the language, the lessons also addressed culture. The gentlemen already had a bit of experience with the Chinese culture from their introduction in Guangzhou a month before taking their course. Culturally speaking, the trainers foresee a number of challenges. “Ajax stands for creativity, taking initiative and courage. Chinese people are incredibly driven and there’s a lot of pressure on children to perform. That, of course, offers enormous opportunities to spot and train talent," says Engelkes. “On the other hand, we need to be cautious in our approach with these children. We should be less direct and straightforward with them than we are with Dutch children," says Kebsch. We wish the Ajax team luck in Guangzhou: zhù nǐ hǎoyùn. It was a great experience, but also incredibly hard work. Cat Hai Chiem discovered in his work at Eurail.com that business Chinese differs greatly from everyday Chinese. That was one of the reasons he decided to take a language course at Regina Coeli. When the British transport minister presented a watch to the mayor of Taipei, her act was described by BBC as a “cultural gaffe”. So why is a “watch” not a good gift in Chinese eyes? And what are the right and wrong choices for gifts to Chinese business associates and friends? The answer lies in the Chinese language. Learning Chinese requires a different approach than learning a Western language. That has to do with the fact that Chinese is a tonal language. We asked Lori Tseng-Crevecoeur, one of our Chinese language trainers at Language Institute Regina Coeli, what the best way to learn Mandarin is. Lori has extensive experience in Western business, has given Chinese lessons for years and has authored a wide range of training materials specially designed for Westerners who want to learn the language.